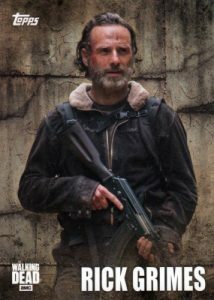 Although first revealed when Topps announced their TWD digital app, 2016 Topps Walking Dead Season 5 officially marks the beginning of their physical card releases for the AMC zombie show. Collectors will find two hits in each hobby box. Breaking down Season 5 into 100 cards, the base set summarizes major events across all 16 episodes. Base parallels build on that amount with Rust (#/99), Mud (#/50), Mold (#/25), Sepia (#/10), and Blood (1/1). 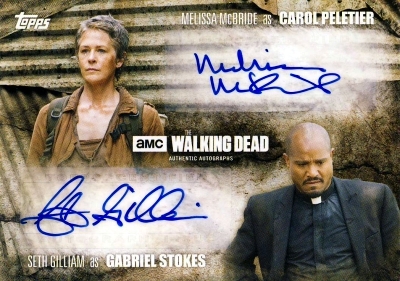 Premium hits in 2016 Topps Walking Dead Season 5 include Autographs, Dual Autographs, and Triple Autographs. Sketch cards highlight key subjects from the season and Relics include show costumes with a variety of parallels. While each hobby box includes two hits, it was not expressly stated what constitutes a hit, so there could be more options. 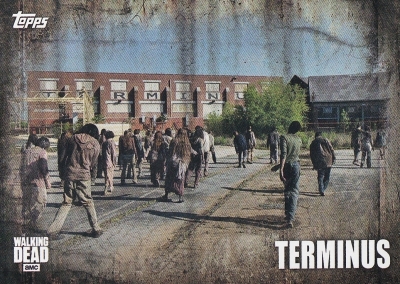 Beyond the hits, there are three inserts to track down in 2016 Topps Walking Dead Season 5. 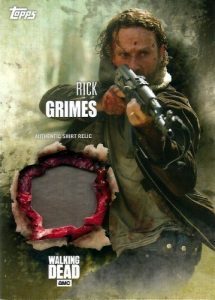 The choices are Character Profiles, Locations and Walkers. 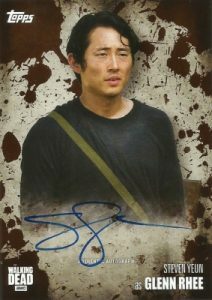 As their TWD debut, Topps takes over the The Walking Dead license from Cryptozoic, who managed the cards for all previous seasons. PARALLEL CARDS: Rust #/99, Mud #/50, Mold #/25, Sepia #/10, Blood 1/1. 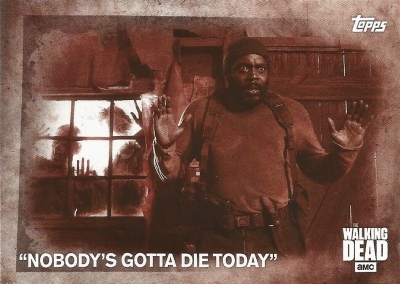 3 "NOBODY'S GOTTA DIE TODAY"
10 "I DON'T MISS THAT SWORD"
61 "WE ARE THE WALKING DEAD"
91 "IF YOU DON'T FIGHT, YOU DIE"
94 "YOU DON'T GET BOTH"
99 "YOU'RE NOT ONE OF US"
18 cards. Some cards have inscriptions. 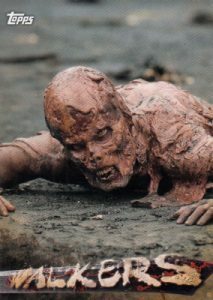 PARALLEL CARDS: Rust #/99, Mud #/50, Mold #/25, Sepia, Blood. Opened a full case. Great value for the price. What a mess! The company’s first outing with this great license and we get a product that is difficult to even look at. Not to mention the typical lazy parallel sets they are famous for. Topps should be ashamed of themselves. I didn’t care much for Cryptozoic’s marketing but at least they put out something nice for the collector. EXCELLENT price point for Hobby Boxes here. Even the retail blaster boxes have a guaranteed hit and are worth your time and money. As a big fan of the show and collecting cards I was just hoping not to be too let down when I bought my first hobby box…… Not even close. Between a dual auto and a 1/1 Maggie shirt relic I was thrilled! If only I could hit like that with Topps’ baseball or football….